When you think of chocolate, you probably think of dark, milk and white chocolates. But chocolate fans may also be interested in trying the “4th type” of chocolate, ruby chocolate. Ruby is a chocolate variety that was developed by Callebaut. The process to make ruby chocolate is a trader secret (although there is a patent out for the process that is likely used in it’s production), but it seems to start from unfermented cocoa beans that become red or purple when treated with an acid. The result is a product that is very similar to white chocolate, but with a unique flavor and a beautiful rose-pink color. At the moment, Callebaut’s Ruby chocolate is only available to professionals, so you can’t buy it directly from the company. You can find it, however at Trader Joe’s. 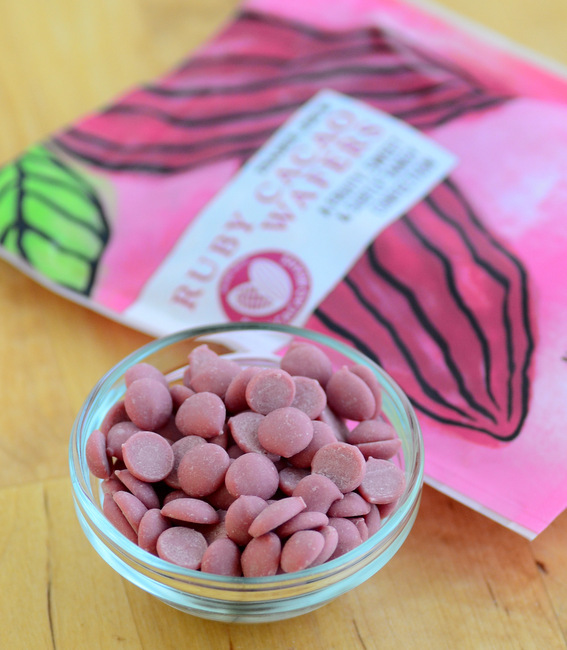 Trader Joe’s Ruby Cacao Wafers are small packages of ruby chocolate chips that are just right for giving this type of chocolate a try. The chocolate is very fruity, with an almost berry-like flavor – and there is no additional flavoring or fruit added to the chocolate. It is as sweet as white chocolate, yet very smooth and melts on the tongue almost immediately. They’re delicious and an unusual change of pace from other chocolate options. Once you have these fruity bits of chocolate, there are a few ways to enjoy them. They can be eaten straight out of the bag or added to a salty-sweet trail mix (where they contrast very well with salted, toasted nuts and dried fruit). They can be melted and used to decorate cookies and cakes. The wafers can also be baked with, incorporated into mousses or cakes, though you might need to experiment a bit, since there aren’t a wide selection of recipes for ruby chocolate currently out there. In any case, if you’re a chocolate fan, these are a fun product to try and I can’t wait to experiment with them a little more!